Chaddsford, PA – On Saturdays, Nov. 6, 13 and 20, Pennsylvania’s Chaddsford Winery, 632 Baltimore Pike; will host special Turkey Tastings, one-hour wine and food pairing classes that focus on pairing different varietals with the traditional dishes of a Thanksgiving feast. For $20 per person, the Chaddsford wine educators will give guests an overview of the whites, reds and sweet dessert wines that best complement the holiday dishes. 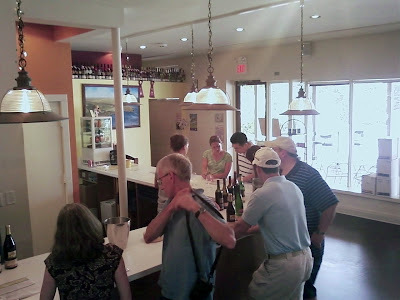 Two tastings will be held each Saturday at 2 p.m. and 4 p.m., and reservations are required; call 610-388-6221. For those who cannot attend the Turkey Tastings, Chaddsford winemaker and proprietor Eric Miller has compiled a few helpful “Turkey Tips” for pairing the right wines with the holiday meal. Miller suggests delicate, crisp, high acid or slightly sweet white wines as classic pairings for Thanksgiving, such as Chaddsford’s: Proprietor’s Reserve White, with enough acidity to cut through turkey’s mellow flavor and stand up to fattier side dishes; Sunset Blush, for its balance of flexible, fresh fruit; or 2009 Riesling, with zingy acidity and slight sweetness. He also recommends guests experiment with his new Craft Cuvee Barrel Select Chardonnay or the Miller Estate Chardonnay from his Portfolio Collection for meals with big, rich flavors such as sausage, nuts, buttery brown sauces, creamy soups or caramel-y squash dishes. For those who prefer red wine, Miller suggests light reds like Chaddsford’s: 2008 Pinot Noir, with delicate fruity flavors; 2009 Dry Rose of Syrah, with graceful berry flavor and mouth-watering acidity; or his 2007 Essence, a distinguished “Terroir Blend” combining all the red grapes from the winery’s Miller Estate Vineyard in northern Chester County. For a meal with spicy elements or other big, full flavors, Chaddford’s Due Rossi Italian blend of Sangiovese and Barbera is a great choice, though Miller warns guests that bigger, fuller-bodied wines such as Merlots or Cabernets can tend to overwhelm delicate dishes. If sweet wines are called for, Miller recommends Chaddsford’s: Niagara, a delicious sweet and fruity white; Spiced Apple, especially for those who serve ham in lieu of turkey; and Dessert Riesling, which is also an ideal after-dinner wine. Frederick Cellars is located in a wonderful old brick warehouse, originally built in 1904 as the Crystal Ice House. Our winery has seen many uses over the years; still, we’re pretty confident in saying this is the first time it’s been a winery. A former building tenant—we won’t name names—says it’s haunted. Time will tell. Through a century, it’s undoubtedly seen many souls come and go. If it is haunted, we’re hoping for amiable ghosts who can appreciate a fine Cabernet. 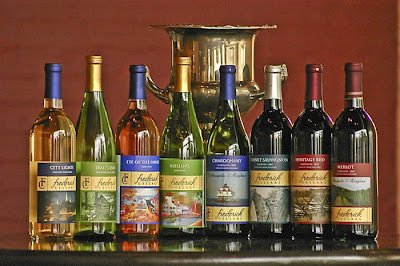 Frederick Cellars recently purchased Catoctin vineyards, one of Maryland’s oldest and most award-winning wineries. Catoctin’s operations have been moved to Frederick. 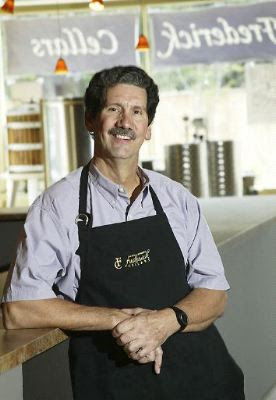 Previous Catoctin owner Robert Lyon will serve as Frederick Cellars’ Wine Master. Trails End wins Best in Class at the 2010 WineMasters Competition. Frederick Cellars does things differently. The winery is located in historic downtown Frederick, a deviation from the rural setting of most Maryland wineries, so it was a challenge to find zoning ordinances that allowed for a winery to exist within Frederick’s city limits. But Daneri followed the advice of a friend who told him, “Put the winery where the people are.” That advice has gone on to benefit not only Frederic Cellars, but also the city of Frederick. "As a unique urban winery in historic downtown Frederick, Frederick Cellars has been instrumental in the revitalization of the east side, bringing in new patrons, pedestrian traffic and investment,” says Richard Griffin, Director of Economic Development for the city of Frederick. “Frederick Cellars has added value to Downtown Frederick and has strong support from its followers." Daneri and his wife, Emily Williams, got into the business after their children had grown and left the house. Williams’ father was a farmer most of his life so, as Daneri put it, “Farming’s in her blood.” In 2003 the two went in search of a piece of land they could do some growing on. They visited Catoctin Vineyards and spoke with owner, Bob Lyon. They explained to him what they were looking for and were directed to a vineyard in Middletown, Maryland. 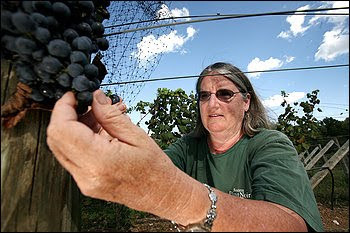 Formerly owned by three doctors, the vineyard was started in 1992 and sold grapes to Catoctin Vineyards. Shortly after buying the Middletown property, Daneri bought Catoctin Vineyards from Lyon, who was getting ready to retire. Although Daneri loved Catoctin Vineyard’s location, it was too far from home, so essentially he bought the equipment, inventory and brand name. Daneri credits Lyon with being a mentor when it comes to winemaking. He decided, however to change Catoctin Vineyard’s name. “So even though we were a new winery in 2006, we decided to change the name because we were going to be a city wine,” says Daneri. 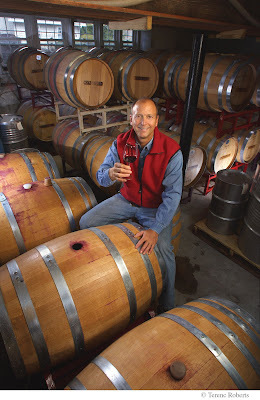 “We are a new winery with a vintage background.” Frederick Cellars was born. 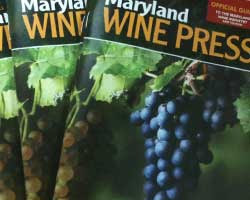 New Maryland Wine Press magazine Now Available! The Maryland Wineries Association and Custom Media Options have teamed up to create the bi-annual "Maryland Wine Press," available at wineries throughout the state. It provides a listing of all wineries and wine trails, and includes feature content about some of Maryland's most successful grapes. Full Disclosure: Josh M. Bernstein is one of my authors. But through him I found ut about the New York City Homebrewers Guild. This stuff is too cool not to mention. October 8, 2010 10:25 a.m.
Why: Because the retail options for buying equipment and ingredients in New York City have multiplied from basically nothing to several in just the last few years, and an entire subculture has sprung up. On Saturday, Oct. 2, I hoofed it from the Metropolitan stop on the G train (why did I trust that subterranean Dodge...) and texted Josh Bernstein that I would be late for the Brooklyn Homebrewers Tour. I met Josh in early September in Denver during the Great American Beer Festival. He writes about beer for AOL News, among other places; and has been organizing tours of homebrewers' lairs for about a year now (cost $25; next one's likely to be in November). He also has a book coming out next year from Sterling Publishing: Brewed Awakening. This particular tour would take a group of about two dozen through three places in Williamsburg, each a celebration of a locavore approach to liquid bread that one would not have expected to grow in a megalopolis rarely envied for its extra square footage. 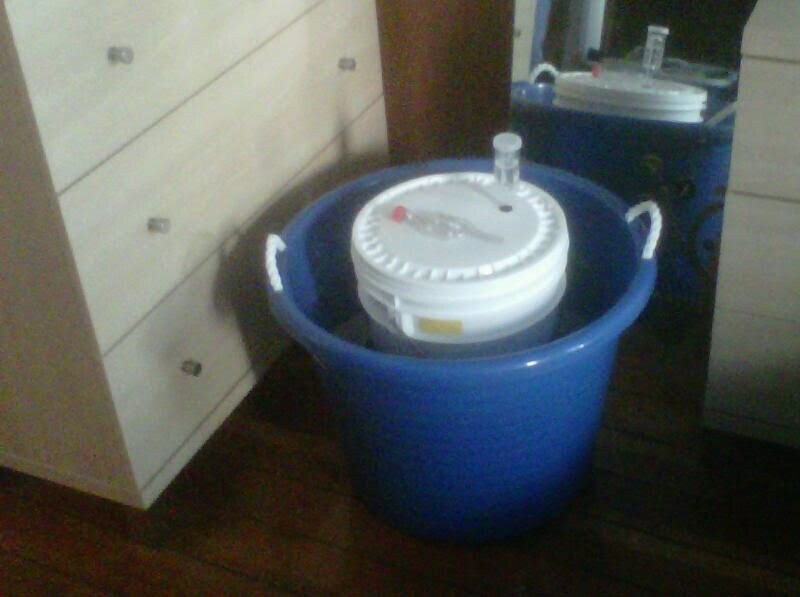 Or: How do you brew a commercial-quality craft beer in a small apartment? Answer: quite well. Josh was waiting outside the first stop, a second-floor walkup on Wythe Street, where Ray Girard, president of the New York City Homebrewers Guild, lives. Mr. Girard, a trim, 29-year-old native of Western Massachusetts, was a natural introduction to a subculture that may appear at first as opaquely laden with physics, chemistry and microbiology, weighted by its own David Foster Wallace-esque terminology (you ever sparge your wort into a lauter tun? ); but that in the hands of someone amiable like Mr. Girard becomes something else entirely. It becomes fun. Math class turns into P.E. I'm a little late to the table in announcing this item, since it took place almost three weeks ago. Sorry about that. But, it's amazing to see the progress Connecticut wines are making! And again, it's nice to see a state where the state government gets it, and partners with its agricultural interestes and wine interests. ...The face of farming has changed in Connecticut, shifting from dairy farming to niche farms that produce organic crops, meats, eggs and milk, many of which will be represented next weekend. Among them will be Beltane Farm of Lebanon, specializing in artisanal goat milk cheese, including an award-winning fresh Chevre, French-style ripened cheeses and feta. Ladies of Levita Road Farm, also in Lebanon, concentrates on fresh cow milk cheese and yogurt, while Cato Corner Farm, a small family farm in Colchester will bring its raw cow milk aged farmhouse cheeses, including Bridgid’s Abbey, Hooligan, Drunk Monk, a six-month-old Dutch farmstead cheese, and Vivace. A new cheesemaker, Woodbridge Farm in Salem, rounds out the cheesy quartet with its own raw cow’s milk and washed rind cheeses. 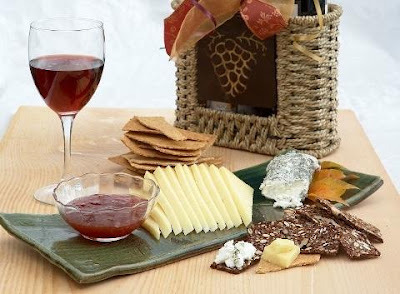 Cheeses of the Northeast, from Vermont’s sharp cheddars to New York’s goudas, will be introduced by Artisan Food Store, while guests will have the opportunity to match their favorite cheeses with wines from Hopkins Vineyard, Jones Winery in Shelton and Walker Road Vineyard in Woodbury. Don’t fear wine pairing, Mr. Camm said. Visitors will be given a basic understanding in this very precise process. If you find yourself craving a glass of Haight-Brown’s chardonnay or Priam Vineyards Salmon River White, it could be because of some federal money. The U.S. Department of Agriculture is giving Connecticut $75,000 to market local vineyards and wines. The money comes from the Specialty Block Grant Program. In all, the USDA is giving Connecticut $445,000 for 10 projects that range from honey production to building a maple syrup empire and beyond. It will go toward raising consumer awareness about the quality of locally produced wines and promote the state wine trail. “This federal award is extremely important to our state and our farmers will get significant, long-term benefits from the programs and projects this grant will support,” State Agriculture Commissioner F. Philip Prelli said. Other projects include helping honey production by establishing an apiary at the Massaro Farm in Woodbridge, teaching farmers about storing produce in the winter, sustaining a competitive CT Christmas tree production and more. Jones Family Farms in Shelton can count on a healthy crop of Christmas trees every year: Spruces and firs thrive in Connecticut soil. It's the wine grapes that require a little hope and prayer. "You can't make good wine from bad grapes," said Jamie Jones, a 34-year-old graduate of Cornell University's College of Agriculture and Life Sciences who runs the 160-year-old farm and its far newer winery with his wife and parents. But as the 2010 harvest comes to a close and the making of next year's wine begins, the Joneses and Connecticut's other winemakers, more than 30, are bright-eyed with hope for this year's grape crop, thanks to a warm and relatively dry growing season that offered a greater number of what vintners call "growing degree days." Some local growers are calling the 2010 harvest the best ever, and Connecticut's largely overlooked winemakers expect to make some of their best wines yet — maybe even a few that will earn respect outside a state better known for swords than ploughshares. "We pretty much had a California summer," said George Motel of Sunset Meadow Vineyards in Goshen, which has 21 acres planted with grapes and makes about a dozen wines. "In all cases you can expect some pretty good quality wines coming out of this vintage. "Connecticut's wineries could use a harvest for the ages. Last year's came close to disaster, due to low temperatures and heavy rain. Plants grew moldy, the grapes were small, the bunches sparse. 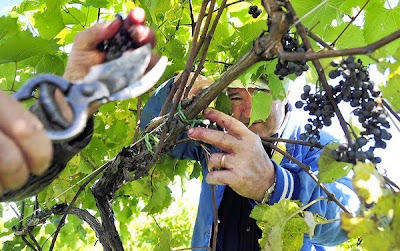 At least one vineyard harvested as little as 10 percent of its grapes in 2009. "It was a failure," said Tina Torizzo of Haight-Brown Vineyard in Litchfield, founded in the mid-1970s by Sherman Haight Jr. and sold to out-of-state owners in 2007.At this time last year, "You would be looking at people saying, 'What are we going to do with these grapes?'" said Jeff Vernon, the winemaker at Chamard Vineyards in Clinton. That weak harvest forced some winemakers to rely heavily on reserves, blends and a greater share of imported grapes — tactics that undermine efforts to win Connecticut wines the respect already accorded to wines from the North Fork of Long Island and the Finger Lakes region of upstate New York. About 40 years after Haight planted what's believed to be the state's first wine grape crop, "There are people that don't even know there are vineyards in the state," said Bridget Riordan, sales director of Chamard Vineyards in Clinton, which is best known for its estate Chardonnay. But if ever a moment was ripe for success in Connecticut, this is it. "I have to believe that it's as good a year as we're ever going experience," Vernon said. 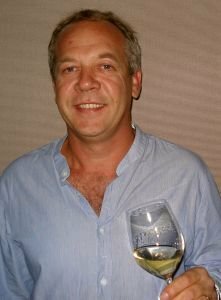 W. Blake Gray, author of the widely read wine blog Gray Market Report, admits he can't name any Connecticut wines, although he admires several New York rieslings. "The wine industry likes to point out that all 50 states make wine," said Gray, who is based in San Francisco. "That's the only reason I know Connecticut makes wine. Never heard of it. Never seen one." LAWRENCE — When Tannwen Mount came home to the farm after working for six years in California, she had an idea. Weekends spent exploring wineries and tasting wines in the Sonoma and Napa valleys had reminded her of her farming roots, growing up at Terhune Orchards in Lawrence. It also had taught her what she liked in wine. So she came home and asked her parents, Gary and Pam Mount, to consider expanding Terhune’s varied crops to include wine grapes. Known for their apples, peaches, berries and field crops, the Mounts had no background in the specialized field of growing wine grapes. But Gary Mount said rejection was not an option. “If your children are interested in your business and they have an idea, you listen,” he said. In this case, they also said yes. With that, Tannwen became the 11th generation of Mounts to farm in New Jersey. 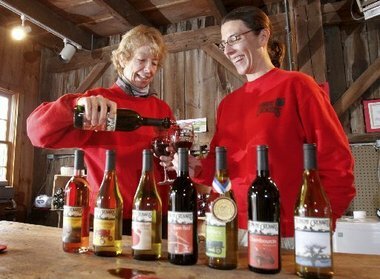 She has taken on a variety of roles at the farm while she and her family made the six-year journey toward Terhune Orchards becoming the third winery in Mercer County and one of 39 in New Jersey. The planning, planting, nurturing and winemaking came to fruition last month when Terhune debuted seven wines in its new tasting room in a 150-year-old barn near the farm store. The timing was deliberate; thousands are visiting Terhune during a fall family weekend promotion to pick apples, choose pumpkins and listen to music. A stop in the wine tasting room was an added bonus. “The response to the winery has been great,” said Pam Mount. Adding wine, she said, “broadens the scope of the farm.” Now young adults who visited the family-friendly farm as children to eat apples and feed the animals are coming back to taste the wine. Adding the winery also solved another dilemma that often hits family businesses. “One of the challenges of a family business is when the next generation comes in, being able to find another source of income,” said Pam Mount. Wine is a growth business in New Jersey. According to the Department of Agriculture the 39 licensed wineries are a dramatic increase from 12 in the state just over a decade ago, and the Garden State ranks seventh in the nation in wine production. In first place is California, followed by New York. In 2009, New Jersey wineries produced 1.7 million gallons of wine and the state netted $144,666 in tax revenue from the sale of locally produced wines. While the Mounts make establishing a winery look easy, it took a lot of work. Gary, who learned to grow apples from his father while growing up in West Windsor and became an expert on growing coconuts while serving in Micronesia in the Peace Corps, has remained a student of farming. Each year he adds to and refines his repertoire and the farm’s range of crops. But growing wine grapes is complicated, and it meant going back to school. “You buy $10 worth of seeds and $100 worth of books,” he said. Reading the books comes before putting any seeds in the ground. Starting the vineyard coincided with the Mounts’ purchase of the former Johnson farm on nearby Van Kirk Road, which increased the farm’s total acreage to 185. The purchase “opened up a lot of possibilities,” Gary Mount said, allowing them to plant nearly five acres in wine grapes and the rest with certified organic crops. 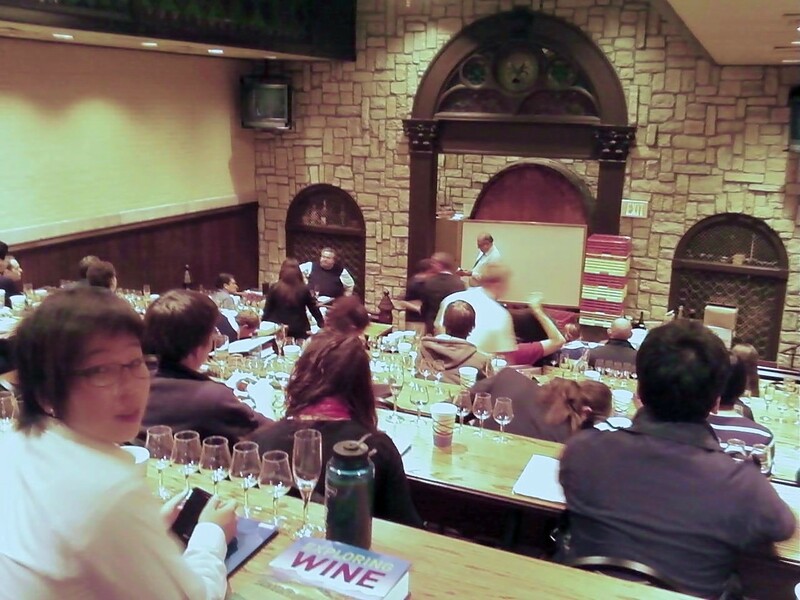 As they planned and planted, Gary Mount spent a week at Cornell University taking a course in winemaking. 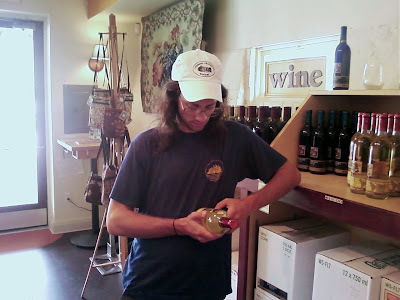 He kept buying books, this time on how to make wine. Wine vines take a while to grow, and their yield increases over time. So newly planted vines produce little juice for wine, which is one reason the grower must wait years for a return on his work and financial investment. A professional winemaker has helped make the current wines except for the apple wine, which was crafted by Gary Mount and his son-in-law Mike Hanewald using the farm’s apples. For anyone who's really watching the East Coast wine industry, and wondering what's going on, they should know two things - The Finger Lakes have arrived and that Virginia is far out performing New York state. 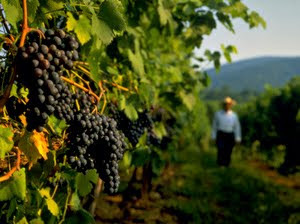 And Virginia is the fifth largest wine producing state in the country. The two facts are irrefutable. Most impressive is Virginia. Virginia gets it. 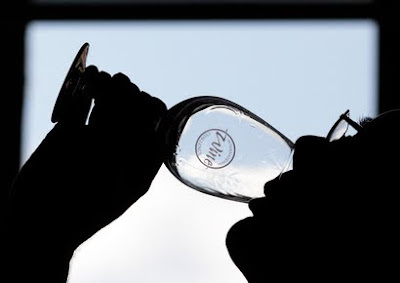 It's winemakers have participated with a state government who gets it. The total Virginia wine industry is worth $350 million, which is less than half the industry it is in New York, where the industry is a whopping $1 billion. But the executives in Virginia's Governor's office, and the state legislature, understand that their wine industry is among their best tourist attractions - and that's in a state that has some very exciting attractions - Mount Vernon, Monticello, Williamsburg, Arlington, Charlottesville, Richomond, Alexandria, and many others. Virginia is outspending and out efforting New York $4 to $1. 2. The Virginia Department of Transportation increased road signage and tourism awareness with an additional $3.5 million to help promote locoal tourism. 3. The Governor and First Lady and Secretaryof Agriculture went to London to kick off a Grand Tasting of Virginia wines, where Virginia has gained a toe-hold in the UK market from long-term promotion there. 4. Virginia stole Wineries Unlimited away from Philadelphia. While hosting the event, they will host a Grand Tasting of Virginia wines to promote their wines. 5. Virginia hosted a wine bloggers conference, inviting as many wine bloggers to attend as possible. 6. And Virginia hosts a large Food & Wine culinary event each year, promoting local agriculture and wine. 7. Virginia's website is a conumer oriented, graphically pleasing, and fun website aimed at consumers. 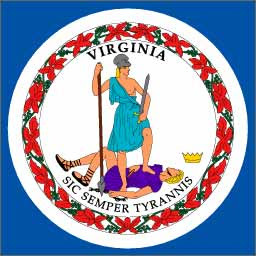 There is no question that men like Richard Leahy and Washington DC wine columnist Dave McIntyre have woken up a sleeping giant in Virginia. And one must applaud Virginia Secretary of Agriculture Todd P. Haymore. These are all the reasons Virginia wines will soon eclipse New York's, if not for size, at least for cachet and desirability. Congratulations to Virginia! Nice to see an East Coast state that gets it. And some great wines to boot!!!! Oz Clarke, renowned wine expert and writer visited with one of Long Island's best winemakers, Richard Olsen-Harbich at Bedell cellars. While there he toured the vineyards, did barrel tastings, and gave a lecture on wine and led a wine tasting of Long Island wines featuring Bedell Cellars. 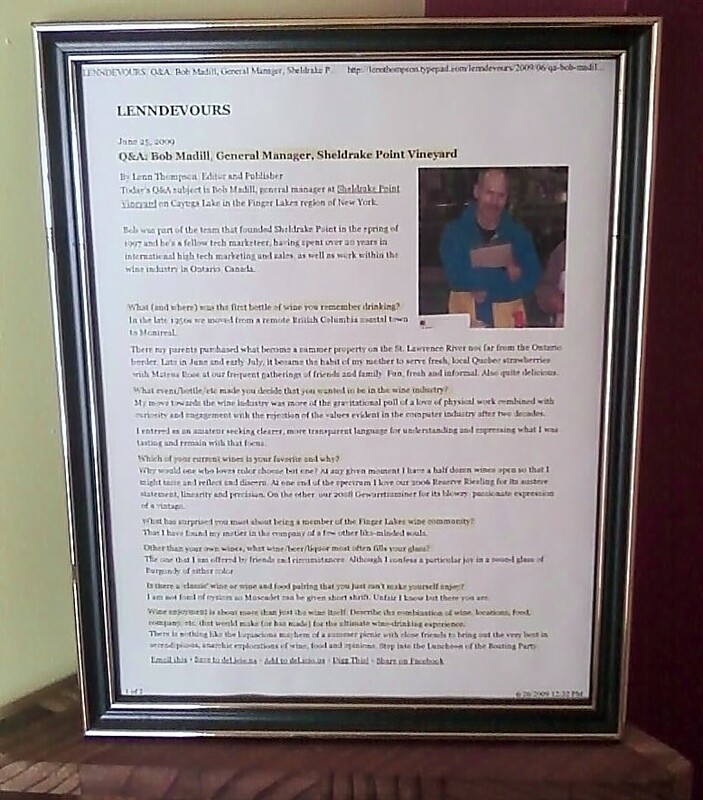 Oz is touring New York state promoting New York wines, and his three new books. 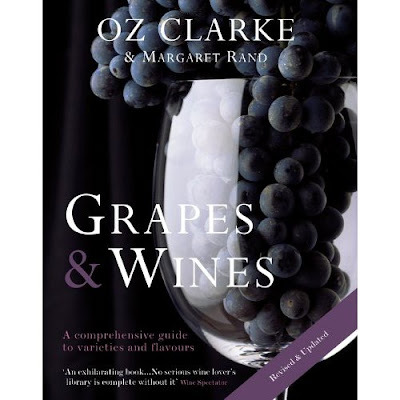 Clarke has published three new books with Sterling Publishing, including The Oz Clarke Wine Guide 2011, Grapes and Wines (a revision of his classic text), and his newest book, Let Me Tell You About Wine. Always informative and entertaining, Clarke wowed the Long Island faithful. Olsen-Harbich, one of the east coast's most adventurous winemakers, impressed Clarke with his newest wines and plans, as well as with Bedell's classic merlots. 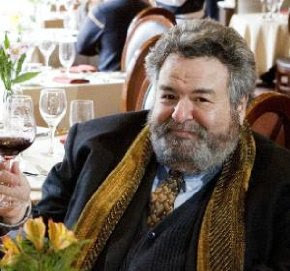 James Beard Award-winning wine expert and author Steve Kolpan (Exploring Wine with Michael Weiss and A Sense of Place with Francis Ford Coppola) will appear on WAMC/NPR on Thursday morning at about 10:30am. He will do an on-air tasting with the hosts of "The Roundtable." Kolpan will talk about New York state wines, especially those oof the Hudson Valley. 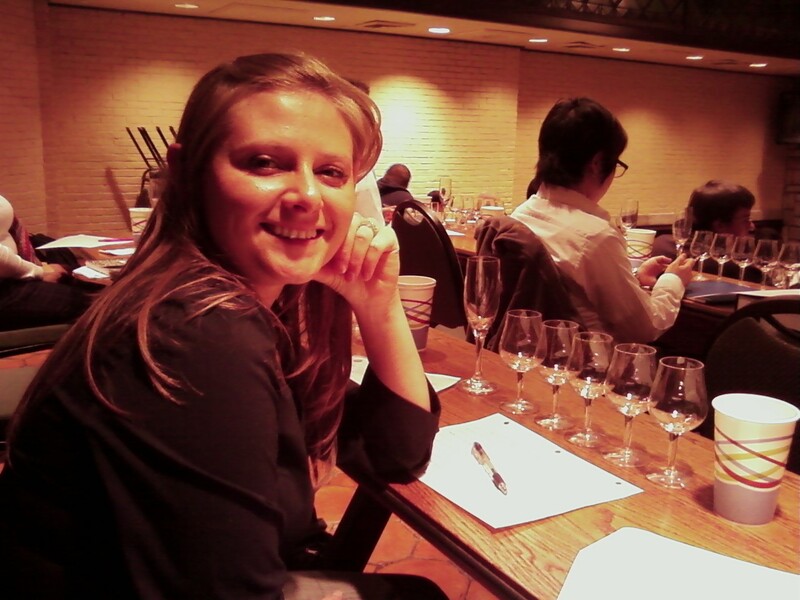 Always a fascinating speaker, with lots of incredible insights, Kolpan is sure to turn wine aficionados heads. Should be a great show. 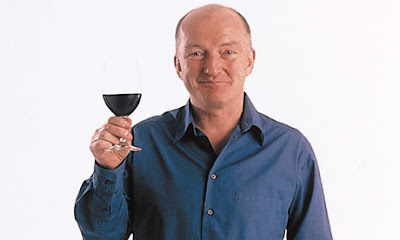 Oz Clarke was touring the Hudson Valley yesterday, Tuesday, October 19, 2010. First he tasted a flight of Hudson Valley wines. Then he made a trip upstate to Hyde Park, where he lectured on world wines in Steven Kolpan's and Michael Wiess's wine class at the Culinary Institute of America. 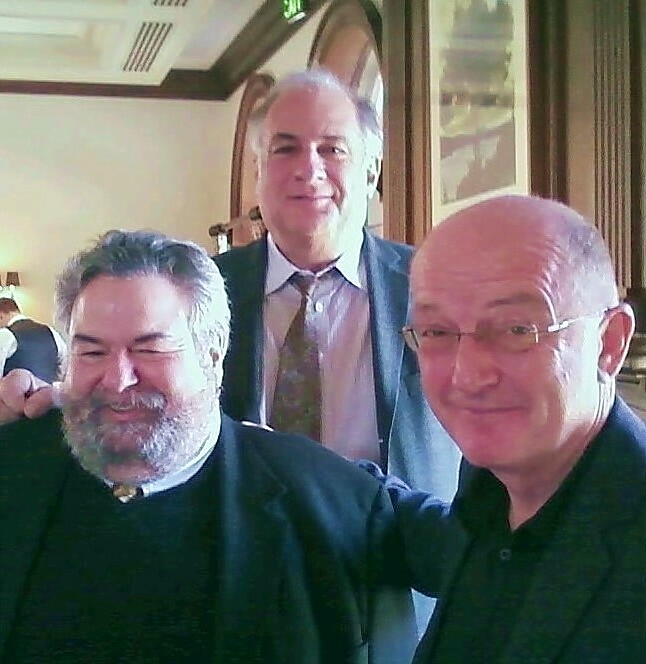 It was amazing to see three great wine experts/writers together. It was an incredible experience. Kolpan and Wiess have written three books together, including what has become the CIA text book, Exploring Wine. Oz is out supporting his three new books, including his Pocket Guide to Wine 2011, his new expanded Grapes & Wine (a classic of the genre), and Let Me Tell You About wine, an introduction to wine. This was the hall being set up before the lecture. This is Oz's publicist Caroline Mann. A great time was had by all. Will add Oz's tasting notes in the near future. "These are my experiments," she said recently, grabbing three plastic bags filled with grapevine cuttings from the crisper drawer of the fridge in her Charlottesville home. "I like to practice my fungal identification skills." And there's always a chance she will discover something new: "I'm quite sure some of these little dudes are causing problems," she said, scrutinizing a sample inside a bag. Talk with Morton, 59, about her work as an ampelographer, and you will quickly learn that not only does she call fungi "dudes" but she has a fungus named for her. Phaeoacremonium Mortoniae was christened in 2001 after she helped identify another fungus responsible for "black goo," her name for a disease that afflicts American grapevine rootstocks and causes young vines to wither and die. Morton was instrumental in establishing that nurseries were selling vines infected with the fungus. While that established her fame among fungus enthusiasts, Morton's influence skyrocketed in recent years with the initial success of three high-profile Washington area clients: Black Ankle Vineyards and Sugarloaf Mountain Vineyard in Maryland, and Boxwood Winery in Northern Virginia. She also consults for Chatham Vineyards on the Eastern Shore and Rosemont in southern Virginia, which won best of show at the Atlantic Seaboard Wine Competition in July for its Meritage. She has other clients who have not yet released wines. Throughout the year, Morton can be found trudging through her clients' vineyards in Virginia, Maryland and Pennsylvania, followed by her constant companion, a Norwich terrier named Randy. She is looking for signs of mealy bugs, downy mildew, bunch rot or any number of afflictions that can prevent grapes from ripening. "I like to wage war on green flavors," she said during a recent visit to Sugarloaf. A vineyard consultant of Morton's caliber can help budding vintners start on the right track without spending several vintages experimenting. After all, she planted one of Virginia's first modern vineyards in 1973, when her father decided to grow grapes on the family farm in King George County, and she translated the seminal French text on grapevine identification into English. "We consider Lucie to be our Moses, leading us out of the wilderness," says J. Michael McGarry III, a co-owner of Sugarloaf, whose family made the switch from cattle to grapes. When former Redskins president John Kent Cooke decided to plant a vineyard on his Boxwood estate near Middleburg, he enlisted Morton. It was a two-year process, from taking soil samples to choosing clones and planting the vines. 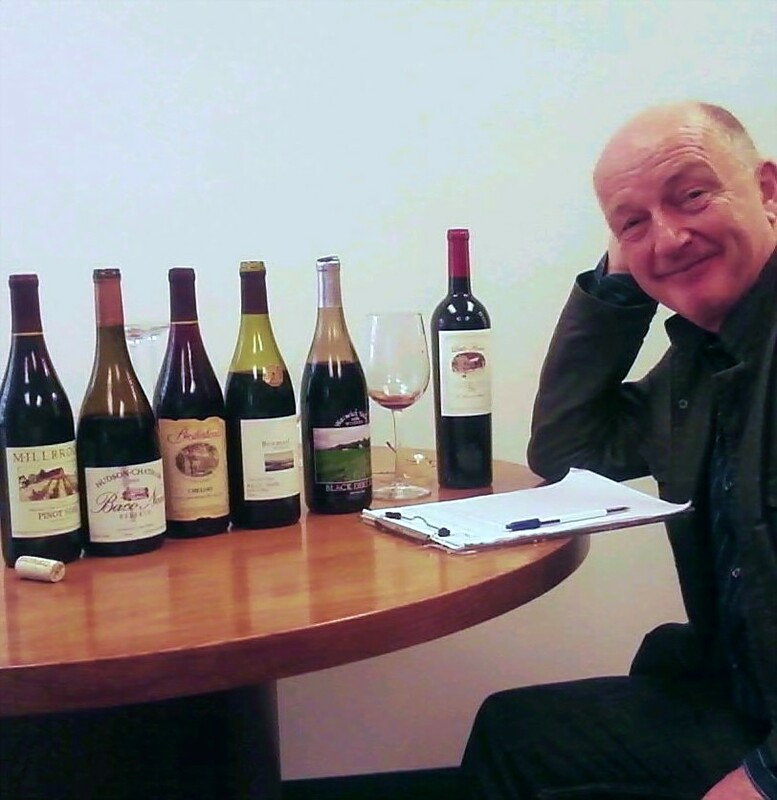 OZ CLARKE GOES LOCAL - IN NEW YORK! British wine expert Oz Clarke will be touring the New York state wine country, discussing local New York wines, as well as wines from around the world. He's one of the sharpest wine writers I have ever met. Dashing, funny, incredibly knowledgable, and absolutely entertaining. Don't miss these three opportunities! Sunday, Oct 17, 2-4:00 p.m.
Tuesday, Oct 19, 5-6:00 p.m. 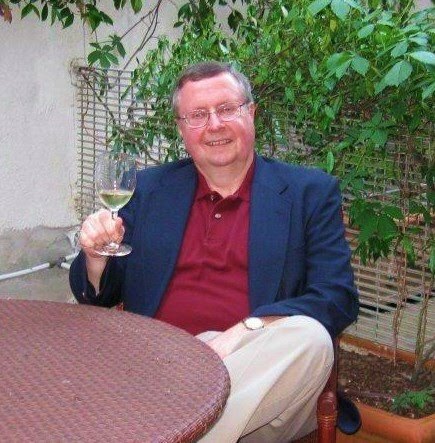 Following a private lecture and tasting with professor Steven Kolpan’s wine studies class, Oz Clarke will be available to sign books and mingle with students and the local community at the Culinary Institute of America Craig Claiborne Bookstore. Copies of Let Me Tell You About Wine, Oz Clarke: Grapes & Wines, and his indispensable Pocket Wine Guide 2011 will be available for purchase. This event is free and open to the public. Wednesday, Oct 20, 6:30-8:30 p.m.
Oz Clarke is renowned for his lively, accessible approach to wine. Join him for a sparkling wine reception, guided wine tasting class and book signing to celebrate his new book, Let Me Tell You About Wine. The New York Wine & Culinary Center will be Clarke’s only stop in Western New York during his US book tour. Each participant will receive a copy of Let Me Tell You About Wine upon arrival. Both novices and wine experts alike will appreciate learning from this master taster and writer. Tickets are required for this event. I get John Grover's wine email newsletter. He's always finding great wines. He's a real enthusiast. 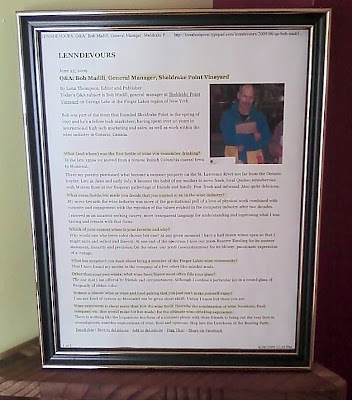 I recently asked him if I could reprint a recent letter because it featured Finger Lakes wines. Here it is....two good picks, and a great recipe. This summer the Boss and I had the opportunity to visit the Finger Lakes region of New York State. We stayed at a bed and breakfast in the Village of Penn Yan which is located at the Northern end of Keuka Lake. The B&B was quaint; the landscapes were breathtaking; and, the wine tastings at the many vineyards around the lake were ever so good. The recipe for this month was determined by the sudden surplus of eggplants coming from our garden. But, it turned out to be a wonderful dish and a nice match to the wines below. 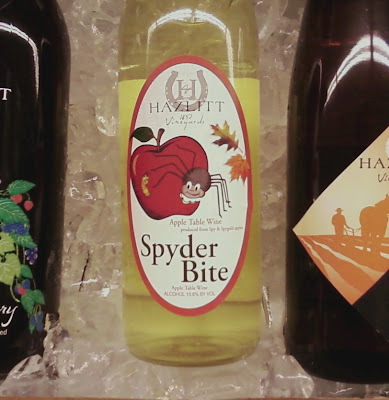 The wines this month are from wineries located on the east side of Keuka Lake. The first is the 2008 Traminette from Rooster Hill Vineyards. Traminette is a clone of the Gewurtztraminer grape. This wine offers floral scents and the taste of spicy fruit and citrus rind. It finishes crisply with a little pucker across the tongue. It is available at the winery for $12.99 a bottle. The second wine is the 2007 semi-dry Riesling from McGregor Vineyard. The Finger Lakes is famous for its Rieslings and this one does not disappoint. It gives you the bouquet of peaches and orange blossoms. And, it fills your mouth with the luscious full fruit of peaches and apricots. This wine is more refined, and not as acidic as the first; but, it still has a clean finish. It is available at the winery for $17.99 a bottle. Heat oil in heavy large saucepan over medium heat. Add curry paste; stir until fragrant, about 1 minute. Add chicken; stir 2 minutes. Add green beans and eggplant pieces; stir 1 minute. Add broth, coconut milk and fish sauce; bring to boil. Reduce heat; simmer until vegetables are tender, about 12 minutes. Season with salt and pepper. Stir in basil and serve. We served this with a large dollop of jasmine rice in the soup bowl. Also, regular eggplant will do if the smaller Asian varieties are not available. A rural haven nestled between New York City and Albany, is becoming a leading player in the farm-to-table movement. The Hudson Valley, a rural haven nestled between New York City and Albany, is becoming a leading player in the farm-to-table movement. With a host of restaurants offering locally-sourced produce and a new generation of farmers, cheese-makers and winemakers with a commitment to sustainable agriculture, there's a slew of dining options. Sheldrake Point Vineyards Cabernet Franc Ice Wine - A Red Ice Wine? Fantastic! I just wrote about the fine folks at Sheldrake, but last night, we are with Tom and Mary Hack who own East Chatham WIne and Spirits. Mary is a trained opera singer (she also does other styles), an just finished a limited run of a light opera based on an episode of Julia Child's show where they set an entire episode to music. Very cool. So it was just Dominique and Tom and Mary and I, their four brown, fury and lively Boykin Spaniels, and the largest black cat I have ever seen, WInston (is is the store's mascot, but is visiting home for a few weeks. Anyway, we shared some wonderful wines from around the world. And for with the cheee course, which featured many local Hudson Valley artisanal cheeses, Mary pulled out the Sheldrake Point Cabernet Franc Ice Wine 2008. I was a little curious....maybe a little doubting. Cab Franc ice wine? I was worried it would taste like a bad Formula 44 D, the old cough medicine. A red ice wine? "A delicious sweet Estate dessert wine produced in the classic manner from grapes frozen on the vine, hand harvested in the dead of winter and pressed immediately. Glowing ruby in color, a prominent, aromatic nose projects sweet strawberry compote. Full bodied and luscious in the mouth with flavors of sweet red fruit preserves and orange peel. Beautifully balanced and harmonious with a finish that rings." Now let me tell you this - it tastes better than they describe. With the cheeses it was fantastic! The sweetnness and acidity were refreshing against the creaminess of the cheeses. And the flavor was incredible. A fabulous ice wine! A tremendous surprise! I greedily had a second glass, and then finished the last drop. Wow! I know for all the wine snobs out there the idea of apple wine is something abhorrent. But I have had several apple wines I have liked very much. One of the best ones is the Spyder Bite. This is made from Spy and Spygold apples. The resulting wine is a semi-sweet deep yellow wine. It smells like you just bit into a fresh apple, and it tastes like it too, with some sweetness and nice acidity. It's great cold, and it's also great served warm with mulling spices. This is a seasonal wine, so you have to buy it now, because it will not last the season. ON a recent warm summer evening, well over a thousand people packed the lawns at Boordy Vineyards in Hydes, Md. Families tucked into picnics, toddlers ran freely, and couples and singles danced on the makeshift floor to a swing band pumping out oldies. But the main reason for the crowds was the wine. Boordy, situated on a 240-acre farm a mere half-hour outside Baltimore, was a dairy and cattle farm for more than two centuries before becoming a winery in 1945. On this night, the cavernous tasting room — where cows were once milked — was lined with patrons sampling from among the vineyard’s 18 choices; an outside bar was selling full pours. The wines on offer were quaffable, even enticing, but the mostly local crowd spending Saturday night at Boordy captured the essence of Maryland’s fast-growing wine scene: coming here is as much about having a good time as it is about having a good sip. As the state’s first winery, Boordy was an outlier until a second opened in 1962. A handful debuted over the next few decades, but since 2001, four to five have sprung up each year, many opened by baby boomers trying second careers. Today, there are 39 in all, with three more set to open this fall, and an additional 12 planned for 2011 and beyond. Thus far, Maryland wine is rarely available outside of the state, so when my husband, Mahir, and I — both wine enthusiasts — heard about the burgeoning area, we made the train trip from New York City to Baltimore to see it firsthand. What we found is a homegrown industry that has plenty to offer the casual visitor, vintages worthy of national recognition, and a chance for some first-class vineyard-hopping. 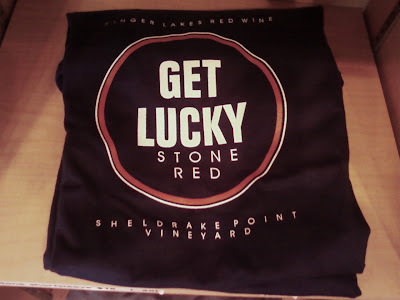 Sheldrake Point Vineyard, Gamay, and Cab Franc, and Gewurztraminer - Oh My! So, I am a little behind in my Finger Lakes postings. Technical difficulties. I couldn't find at least half the photos I had taken. What a stupid, lame excuse, that is nonetheless true. Anyway, Aaron and David and I went to Sheldrake Point Vineyard. I have always been a big fan, and it was a different side of the lake to go up. 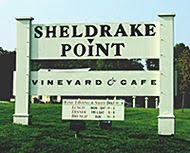 Sheldrake Point Vineyard was founded in 1997. The winery owns and operates a 155 acre farm located on the shores of Cayuga Lake in the Finger Lakes, a vineyard of 44 acres planted to Vinifera vines, a winery producing 6000 cases, and Simply Red Bistro serving savory American cuisine. Current Members include Chuck Tauck as Senior Managing Partner (principal owner) and Bob Madill as Winegrower, General Manager and Partner. Bob was interviewed by New York Cork Report Editor-in-Chief Lenn Thompson. 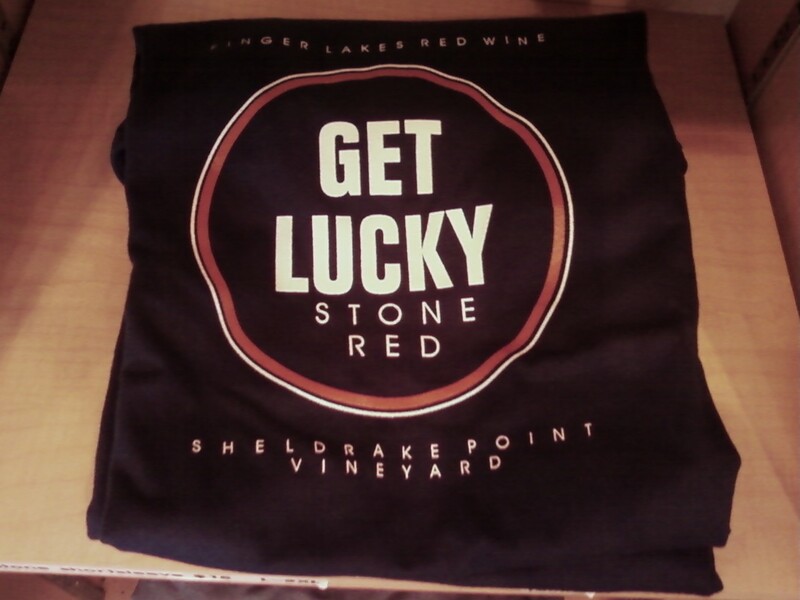 Lucky Stone is a pair of blends Sheldrake produces - a Lucky Stone red blend and a Lucky Stone white blend. Both are affordably priced, and are popular with consumers. Sheldrake Point Vineyard encourages visitors to spend some time on their beach and walk along the shore of Cayuga Lake. According to the winery folks, while you are on the beach, turn over some stones and perhaps you will find your own lucky stone; a stone with a hole bored through by the workings of an ancient worm and the force of water over many years. You may even find a stone with more than one hole through it. Pretty cool, actually. My favorites, of course, are the varietals at Sheldrake Point. I would review the whole line, but it would seem superfluous. A bore. However, I can say, a tasting at Sheldrake Point is a pleasure. The tastingroom is light and airy. The wine bar personnel are friendly and knowledgable. And there are no clunkers as you go through the entire line. That's saying something. There are a lot of wineries you can't say that about around the world. I am a fan of Gewurztraminer. And I am a big fan of Sheldrake Point's Gewurztraminer. Their version of this wine is varietally correct, in that it has a lovely, big nose. Pear, spice, honeysuckle, hints of orange blossom, all come through as promised. I light, light yellow white, this aromatic wine has bright fruit and bright acidity, with just the right balance. A nice, puckery, grapefruity end. An incredible wine. One of my favorites in the Finger Lakes. Fabulous! I am becoming, more and more, a fan of Gamay Noir on the east coast. 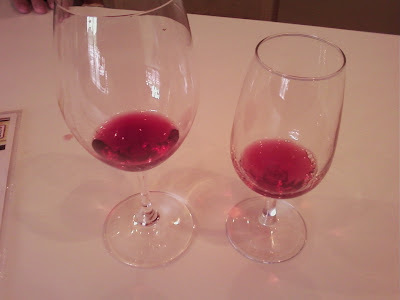 The 2008 Gamay Noir is light ruby in color. There's lots of cherry and pepper on the nose, with a whiff of tabacco as promised. But this tremendous light red wine is all cherries in the mouth that end with a peppery finish. A touch of vanilla and wonderful tannins balance out this wonderful, light, refreshing red. Instantly one of my new favorite wines! Excellent. A small amount of Cabernet Franc on left, and Gamay Noir on right. 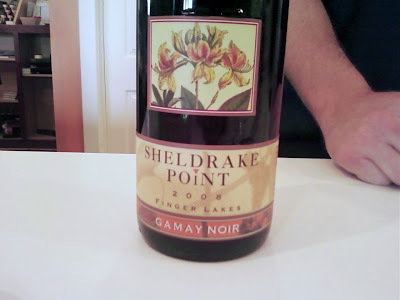 Sheldrake Point's Cabernet Franc is one of my favorite Cab Francs of the Finger Lake region. It's a lighter style, medium bodied red wine. Normally I like deeper versions of the grape, but here, in the expert hands of winemaker Dave Breeden, this slightly juicer version, a more Loire-esque version of the grape, is a wonderful drinking wine. I have written about it before. The 2008 Cabernet Franc is a very nice, purple-red wine. It has hints of raspberry and blackberry, and as expected a herbaceousness, and a feint touch of pencil shavings. Lot's of plum and dark cherry come through, with hints of vanilla and some tea. This is a fresh, lively, bright Cabernet Franc. This is a great wine for lunch, with pasta, pizza, salads, fall soups, even with salmon. A versatile, refreshing dry red. Excellent.